Hi Guys, After publishing the Siril blogger theme, Now we are successfully entering the second week of the BTNT Weekly Special!!! 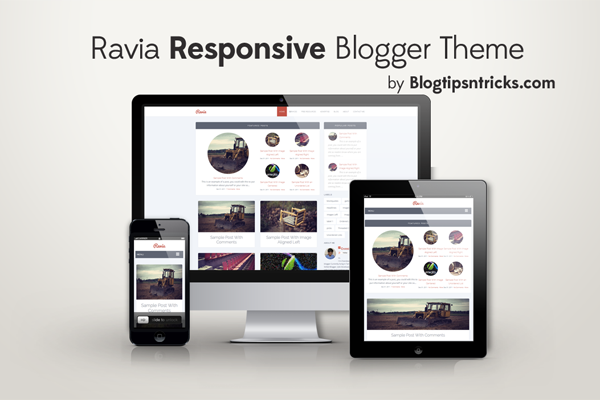 Today, I'm Happy to Introduce a brand new gallery theme, Ravia - A Responsive Blogger Template. Ravia is an Elegant Gallery style blogger template with Custom features like Automatic Feature Post Widget, Cool Popular Post Widget and Inbuilt Social Share buttons, etc. 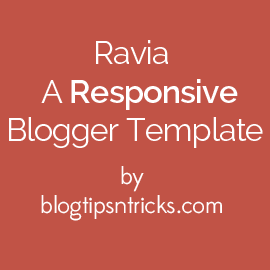 Click the Browse button and locate Ravia a Responsive blogger template. To customize the Navigation Menu, Follow the Instructions given below. We can activate the featured post widget using the layout page. To activate the featured post widget, Follow the Instructions given below. On Blogger Dashboard, Go to Layout > Click Edit On Featured Post Widget. Now, Just add the Name of the label you wish to show as the featured post. you can also create a separate label just to show the featured post. Note:- The label name must be added as is in the label link. Otherwise it won't work. Next Theme on BTNT Weekly Special will be published on coming Sunday, 4th May. + Fixed Pacifico Header Font Bug. + Added Social Profile Icon Widget. Hey chandeep! glad to see the old chandeep back who was always active as you are right now! this template is very nice clean and responsive i like it but a little bug i think you forgot to remove the list style of comments! oh!. amazing chandeep!... you are back again with new template.. thanks for this nice and very beautiful template.. it's amazing... i loved it.. i am looking forward for your upcoming posts. Thanks, More Awesome Stuffs coming. not to mention thanks chandeep... i have some problem.. in my blog reply button is not working how to resolve that problem.. I am using your template sensational.. on my blog... reply button is not working for me.. plz help me..
BTW Kindly ask Off Topic questions through Contact Page. As always you are back with another awesome responsive template. I liked the premium look hidden behind the template. Very beauty and cool theme! Congratulations for the good job. Can i change the color of template? I want blue color. How can i do that? Hello, This is my first time using one of your templates and I love it. I am a novice in html and have a quick question. I am trying to activate my featured post. Can you give me an example of what the label should look like? Never mind, I figured it out. Thanks! Oh! Glad for that, Thanks for using Ravia. http://xxxxxxxx.blogspot.gr/search/label/review it means that I should use the word "review"? It doesn't seem to work. What am I doing wrong here? You're doing everything right, Can you give me a screenshot of the widget content area(where you added the label name). or the exact label link you wish to show as the featured post. I did not understand how to put the popular entries. At least I tried and failed. The popular post widgets are already visible and works fine on your sidebar. Can't get you? Can you explain the problem you're experiencing. To add the adsense just follow these steps. 2) To add below post search for the following and add the adsense code after it. how can I show more posts in the home page? Impressive job done. Hats off. I want to ask you is, Do you own any copyrights on 'FEATURED POSTS' widget? you have to edit with one of your label in its html! sorry when i post something, the image seems very fat how can i solve it? Thanks for your template! I very very like this. But I get a trouble, the image at home page not appeare. Could you help me, please! I keep searching for the Main Menu using Command F, but I can't find it. I've tried to look manually and no luck. I know I'm missing the obvious. Please help! Hi chandeep, thanks for the template which is awsome. I have tried to use featured post but it does not work, what should i put in the featured post content? And how can i show more post at the homepage, below the featured post? I am read your post. It is very useful information for web design services. Thanks for the sharing this Blog. It is very useful professional knowledge. Hello Sir !! I am facing from problem in your template.It may be miss any DIV ib your template.Plese tellme how to solve it.I love your templates,Plese check and tell me what is error..
Hi, i loved this template so much, i wanna know if is it possible to change the background color? if Yes, how? Hi Mr Chandeep, I like this template. I used for my blog, but at the home was no showed like at demo. It is my blog http://www.berita2populer.com. I set the number of post 6 posts at the home. But no shown like the demo. Please, i will wait your reply. Thanks for your great sharing, I love this template. Could you please indicate more about activating the 'Featured Post' widget? thank you very much. I've solved the problem to activate featured post widget because I forgot to make my blog be published. Please ignore my previous question, thanks ! Please guide me activate featured posts. Thank you very much. i want change background. can u help me???? Hi pal, how are you doing? i really commend you for all your great works... pls can you explain to me how to activate the featured post on ravia template?i dont get the grammar on ur instructions. thanks. Hi buddy, Sorry for the delayed response, I just moderated my comments and noticed all your comments/questions. To Activate the featured post on ravia just add the name of the label on the featured post widget area and click save. also pls how do i add related post to it?? Hi, I need help table on post, why no work? what is css and html for this template. How to add a (download now) button like this blog ? i am using ravia.